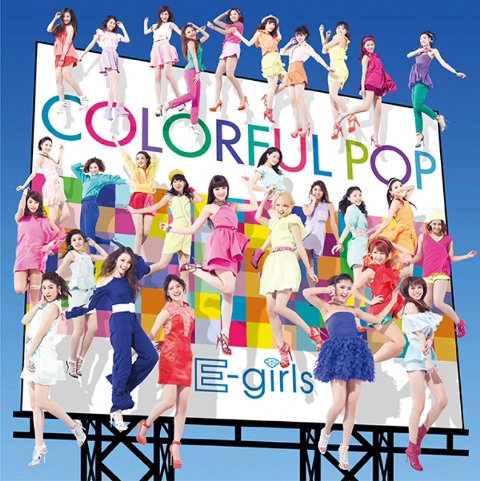 E-Girls are a 28-member-strong idol pop collective constructed by Avex. The “E” stands for “Exile,” as in this is the female version of greased-up R&B doofs Exile. The songwriters and producers making the songs on their second album, “Colorful Pop,” boast backgrounds making mediocre tracks for Johnny’s boy bands and various K-pop outfits. The album also follows on from a forgettable debut last year. Despite every pitfall “Colorful Pop” faces, though, it inexplicably works out after pressing play. This is Japan’s first great pop album of 2014 — “pop” being key — for listeners who have no problems with a crew of studio careerists steamrolling over imperfections in the pursuit of glistening digital thrills. However the careerists pull it off, turning a cheesy album title into an accurate depiction of what awaits the buyer. The best decision by the E-Girls team is to reconfigure J-pop’s past into the buzzing present. Lead track “Rydeen ~Dance All Night~” nabs the synthesizer melody from Yellow Magic Orchestra’s “Rydeen” and uses it as a base. They could have purely ridden the idea for some indie credibility, but instead E-Girls bring things up to a 2014 speed, tinge it with Latin slink and throw on some decadent club-life lyrics. Later, they turn Ann Lewis’ 1979 disco groover “Koi no Boogie Woogie Train” into a shiny ditty that gets easily stuck in your head. Best of all is a cover of ’80s British group Bananarama’s “I Heard A Rumor,” remade into a futuristic thumper that loses none of the original’s catchiness. This isn’t a gimmicky covers collection, though, as the originals go just as hard. E-Girls suffer from J-pop’s usual Achilles’ heel — tempo-killing ballads. However, “Diamond Only” zips along with the help of tasteful dollops of Auto-tune. “ASAP” brings together the best aspects of U.S. singer Ariana Grande and Maroon 5’s “Moves Like Jagger” into a track begging to be blasted out of cars this summer. When rocketing forward like this, “Colorful Pop” sounds like the best Perfume album in years and the year’s most unlikely success.